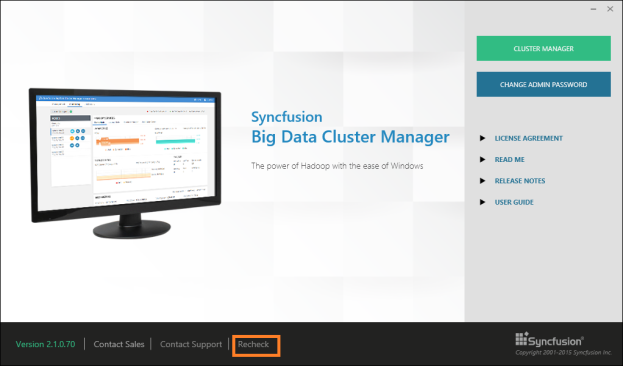 How to let the cluster manager dashboard detect the IIS Express? IIS Express is a pre-requisite to launch cluster manager application. In case you have installed the cluster manager setup without having IIS Express, the cluster manager dashboard prompts a message box to install IIS Express with a download link. Once the IIS Express is downloaded and installed, you have to click Recheck option in the dashboard as highlighted in the following screenshot and restart the dashboard as instructed in the message box thrown after clicking the option. When the Recheck option is not used and when you restart the dashboard, it does not detect the IIS Express installation and shows the same message that the IIS Express is not installed.